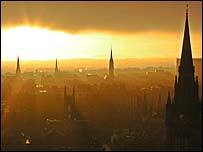 Is Aberdeen's sun rising, or setting? Until not long ago, roundabouts in Aberdeen were decorated with little signs telling you that you were driving through "the oil capital of Europe". Look closely now, and you'll see the wording has been changed to "energy capital of Europe". The distinction is subtle, but crucial. As the home port for the North Sea oil industry, Scotland's third city has waxed rich in the past 30 years. Now, it is seeking to reposition itself for the time - not far away now - when those gushing petrodollars run dry. Aberdeen is in an enviable position. Without itself handling or processing a drop of North Sea oil, it has become the financial, administrative, intellectual and social heart of the industry. Oil money has transformed what used to be a conspicuously dour fishing town: swanky cars prowl its streets; gaggles of Norwegians or Americans gossip in its restaurants. Since the beginning of the 1980s, the oil industry has invested some £200bn in the region, and paid £175bn in taxes. In the process, Aberdeen has consistently enjoyed growth rates higher than the national average, and has an average adult weekly income of £450, 10% above the UK average. Aberdeen's 212,000 people account for just 4% of Scotland's population, but produce almost 9% of its wealth. This has a downside, points out Rita Stephen, head of economic development at Aberdeen City Council. "Aberdeen is not Dallas," she says. The city's population is ageing, says Ms Stephen: the average oil worker is 50-plus, and housing has become worryingly expensive for the lower-paid young. City infrastructure, much of which was hastily thrown together in the early years of the oil boom, is creaking - especially Aberdeen's tiny but frantically busy airport. And the success of oil has squeezed out many of the city's traditionaly industries. 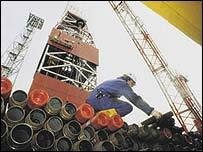 Electricians, for example, can treble their salaries by working on the rigs. Aberdeen's women meanwhile, with few job opportunities in oil, actually have lower wages than the Scots average. But for all the problems, Aberdeen is reliant on oil. A source of prosperity - and instability? The industry directly employs some 40,000 workers in the city, and 80,000 more in the rest of Scotland. Its wider economic effects, providing goods and services to oil companies and their workers, are incalculable: at Aberdeen Business School, dean Bill McIntosh reckons at least 40% of his business comes from the industry. If this business were to disappear, or simply falter, the effects on Aberdeen could be severe. "I was working in South Yorkshire when the coal industry died," says Alan Carnegie, head of the Aberdeen office of Marsh, an insurer. "Heaven forbid the same thing happens here." The North Sea probably won't run dry soon: more than half the region's oil remains under the seabed. Can devolved government cure Scotland's economic malaise? Sophisticated extraction techniques mean North Sea oil can cost as little as $5 a barrel to produce, a figure that compares well with West Africa or the Caspian Sea. But, says Ross McCracken of Platts North Sea Letter, an oil trade publication, big oil firms are nonetheless shifting their attention away from the UK. "There may be plenty of oil, but there are no more big finds - and that is what major firms need to boost their reserves." According to Platts, some 30% of North Sea mobile rigs are currently idle - a figure that points to a sensationally low level of investment in production. For the past five years, North Sea output has been static or falling, at a time when oil prices have been rising sharply. This trend has focused Aberdonian minds wonderfully. Many recall the economic and fiscal catastrophe in the city during the first half of the 1980s, when oil prices more than halved. 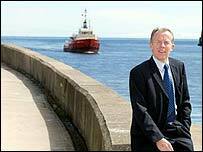 Over the past few months, there have been a series of conferences and seminars - many coordinated by Bill McIntosh, who doubles as head of the local chamber of commerce - on Aberdeen's viability without oil. The council has drawn up a 20-year strategy for the city, in the hope of moulding Aberdeen into "a leading centre of the new economy". Part of this involves making Aberdeen sexier, ploughing money into architecture and the arts, and livening up the city's somewhat grim appearance. There is also money for high technology, with plans for a snazzier city web portal, and a wi-fi remote information network (allowing, for example, tourists to access relevant interactive information on mobiles or PDAs). Most important, Rita Stephen sees the city's future in renewable energy - a nascent business which she calls "a rich seam to mine future jobs". In September, the council unveiled plans for a £40m chain of 20 wind turbines just off Aberdeen beach, linked to a flagship "Energy Futures Centre". Renewable energy looks pretty small beer at the moment, but Aberdeen must be innovative to survive, says Bill McIntosh. He points to the example of Fort Worth, the Texan city that survived the almost complete disappearance of onshore oil exploration. City fathers there were full of innovative ideas, including carving out a tourism industry based around its Western gunslinging past, and buying land in the neighbouring county to build a popular motor-racing track. But like many in Aberdeen, Professor McIntosh wishes the city enjoyed more support from Edinburgh. Always a little aloof from the Scottish mainstream, Aberdeen now frets that Scotland's devolved government is a fief of the Glasgow and Edinburgh establishments, and pays it as little heed as the previous Westminster regime. The council's 20-year plan is being supported with £11.5m from Scottish Enterprise, but in general the city is considered far too rich to qualify for much of the funding doled out by Holyrood. The Scottish Arts Council, for example, spent £3 per head in Aberdeen in 2001/02, compared with £8 in Dundee, £9 in Inverness and £11 in Edinburgh. 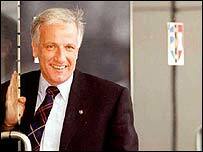 In the meantime, Aberdeen's better companies are pulling their own socks up. For 40 years, the Craig Group was Scotland's leading fishing company, operating trawlers around the North Sea and Arctic; with the coming of the oil in the mid-1970s, the company shifted sideways into providing shipping, supply and technical services to the industry. Now, says managing director Douglas Craig, "it's pretty obvious that there's not going to be another boom in exploration here. 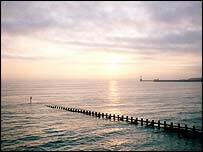 The North Sea is not as important as it was." The Craig Group is currently in the throes of another sideways shimmy, this time by pushing its logistical expertise into international markets. Now, Craig Group has operations as far afield as Nigeria, Azerbaijan, Kazakhstan and Trinidad, and earns £20m of its £90m turnover from overseas - halfway towards its diversification target. "If you're from Aberdeen, you're trusted in this business," says Mr Craig. "It gives the city a great competitive advantage." The Craig Group's experience is being replicated around Aberdeen - and not just by rivals such as the almost equally venerable Wood Group. More broadly, the city is developing a thick layer of promising hi-tech firms, which have spun globally promising ideas out of North Sea oilfield expertise. Tritech, for example, has successfully reworked its underwater imaging and sensor technology for the defence market; Imes Group developed an innovative system of water-filled weights, and has now built itself into a consultancy across the shipping, defence and construction industries. Attracted by an enviable quality of life, IT professionals are moving to the northeast in droves, and some estimates reckon that the Aberdeen area is already home to 30% of Scotland's software businesses. At this rate, they're going to be needing another set of those road signs. Next week, in the last in the series, BBC News Online looks at the failing fortunes of Silicon Glen, and asks whether Scotland can ever build a sustainable hi-tech sector.